Game week 23 was one of my most successful weeks this season. The team has risen on the overall leaderboard to the highest point it has been this season. The past couple of game weeks has firmly put the team back on track for a decent overall finish after a bad few weeks. Again I find myself in a situation where I don’t really need to use any transfers as the team is performing well – I ended up losing my final January transfers and I still have three for February. At the moment I’m not sure that I need to use any. A clean sheet for Kepa chipping in with 8 points. Hoping keeping him pays off with game time during the Europa League. Doherty bagging a couple of goals in the FA Cup was probably the highlight of the week and really helped push the team up the leaderboard. Credit to Chris who initially drew my attention to him very early in the season – for me he’s probably been the player of the season when it comes to scoring points from a low starting value. A goal and star man for Laporte was also great to see. There were a few question marks next to his name when City had a bad run of not keeping clean sheets but I’m glad I stuck with him. A clean sheet for Lindelof, not sure what he has to do to get rated though. A couple of goals for Hazard. A hat trick from Aguero was unexpected against Arsenal. Sane was dropped to the bench against Arsenal. This doesn’t look good for this weekend despite him starting against Everton. City still seem to rotate their midfield a lot which limits game time significantly. My main concern about taking him out is that he may well be dropped against Chelsea at the weekend but what if he comes back in for Newport the following week. This game could be a high point scorer if they field a strong team. Aubameyang drew another blank, however Arsenal do play Huddersfield at the weekend so I’m happy to stick with him for now. They also have the Europa League fixture midweek but I’m not sure he will start this game. It clearly makes sense to target teams with more fixtures, however when you start to think about this in more detail issues start to appear. Chelsea with 4 fixtures stand out as the team to go for compared to say Liverpool. However what if the player bought in doesn’t play in the Europa League – we would then be comparing Chelsea facing Man City (A) and Man Utd (H) to Liverpool playing Bournemouth (H) and Bayern (H). In that situation I’d probably favour the Liverpool fixtures. With 3 transfers in the bag, I really want to tap into this additional fixtures, especially the Europa League games as they are played in such quick succession. However I’m mainly concerned about game time in these fixtures. I’d be tempted to move Robertson on temporarily for a Chelsea defender but this comes with a big selection risk. I’d also be tempted by Lacazette or Higuain, but will either play? Unfortunately we won’t get to see those Europa League line ups before making a decision so it would have to be done this weekend. At the moment this leaves me tempted to hold what I’ve already got. But I’d be interested to hear how other people are approaching this. I’d expect Aubameyang to score well for you this month DTT and he’s the player I fear the most for the next few weeks. I just hope Rashford can keep ticking along to negate that threat from my point of view (one of my rivals has him). Are you going to hold onto Lindelof after the Fulham game DTT with three difficult fixtures to follow and difficult fixtures again after Palace & Soton? I was going to hold onto both of them but it looks like they could both be doubtful for tomorrow. Either way I can’t see an obvious transfer that I’d be happy with long term so I might just stick as I am. Poch has said today that Kane is ahead of schedule and could be back as early as the 23rd Feb against Burnley. More tempted by this move considering Aubameyang could be missing at the weekend? Would it be worth sacrificing a Liverpool defender to cover him? I was personally hoping Gomez would be back and then to jump off Victor/Robo onto Pogba/Gomez but now I have no idea where to go. I honestly can’t see any of the big players playing that Newport game especially with the CL game a few days later. Maybe Mahrez, Foden, Jesus and a few kids/fringe players maybe? I could see Mahrez and Jesus playing but not sure about Sane. They will want to keep him match fit if he doesn’t play against Chelsea surely? I suppose if he plays no part against Chelsea then he could start against Newport. I’d probably expect a few of the big names to start on the bench just in case they are needed to be called upon if things don’t go to plan. Agree with everything you’ve said – might be a bad move to take Sane out if he plays in the FA Cup and can’t risk going too heavy on Chelsea/Arsenal players in the hope they will play. Pogba is scoring well but I don’t think it’s worth bringing him in personally. Not in place to Robertson, who I’d want back at some point anyway. The following week with Man City having newport & shalke I was thinking B Silva and or Sane out for KDB and/or sterling.. Although Man Utd have tricky fixtures I am still not convinced they will leak too many goals as they are set up so well now so will hang on to lindelof and ride the storm for a few weeks. I don’t think I’d personally change anything until you need to. Looks a solid team and we know how quickly things can change in terms of injuries. Just wondering if it’s worth taking Robertson out as oppose to Azpilcueta, extra fixtures for Chelsea, but will Azpilcueta play Europa league, both teams tough fixtures, would probably have to put Liverpool defender back in, in March, so maybe not go down that road. I’d looked at that as well but I don’t want to come unstuck by using transfers for short periods of time. It’s not certain that Azpilicueta will play in the Europa League – without these fixtures Chelsea’s fixtures don’t look very appealing. Are you not tempted to get Pogba in the team ? Anyone think the 0.8m difference between Mane and Sane is worth it ? I have 2.3m to play with .. thoughts on getting ride of Mane for Sterling? Agree about Mane – considering putting him back in for Sane but Pogba isn’t one I’m looking at the moment. 3 transfers remaining and £3.3m in the bank. Good GW last week. In 1,583 points and placed 1,082 overall. In a sticky dilemma now. I’m comfortably top of my ML by around 100 points. Do I try and negate the threat of second place, or do I look to aim for a solid overall finish? 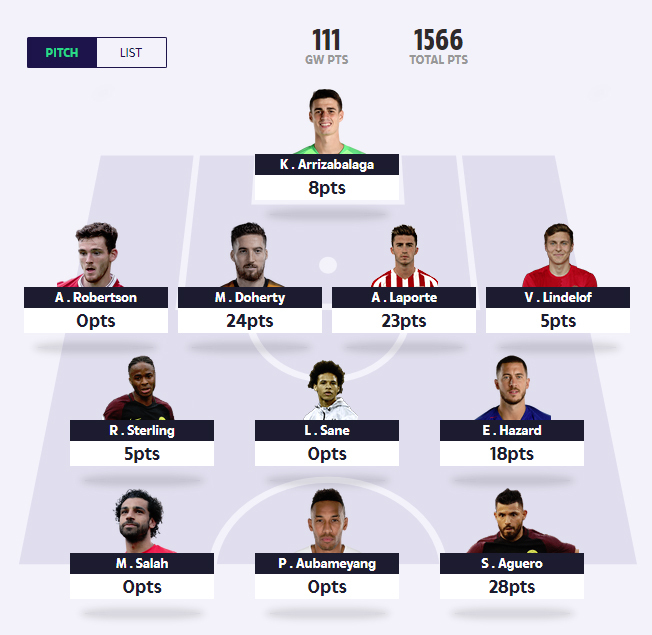 Top 100 “only” 77 points away. I don’t need to make any transfers but I’ve been considering Kepa to Ederson. Bar Malmo (will he even play?) Chelsea have done tough fixtures. City have one game less but arguably easier fixtures. Another transfer I’m looking at is bringing Auba back in for Rashford, which was my plan for GW24. There’s no denying Arsenal’s “easy” run of fixtures, but will Auba get game time in Europe? I’d imagine so. My ML rival also has Auba so this would be a way to nullify the threat. Salah to Auba also crossed my mind although I don’t know if that was just a moment of madness! Again, comes down to whether we think Auba will start. Very doubtful I’d make this transfer in my main team. Higuain also a potential target. Comes down to game time again. Next few weeks will be very interesting! Yeah that’s confirmed . . .He’s not travelled with the squad. Fixtures without Fulham look far less appealing. He hasn’t travelled but I don’t think they’ve said why. To be honest any points from him I’ve seen as a bonus so doubt I’ll personally take him out. It’s a complete lottery this month – question marks against Aubameyang playing tomorrow now. Will Higuain play in the Europa League? For me it’s worth holding Kepa until we know if he’s going to play in the Europa League. I think he’s playing during the group stage? With 2 transfers left considering Auba/Victor to Pogba and Higuain? Both Auba and Victor not with the squad and I’m not convinced Auba will even play in Europe. Not sure Higuain will play in Europa League either so it’s a tough one. Rumour is that Auba is ill? Yep. With transfers in the bank I am going to spin him out for Son. “Today, Aubameyang is sick but I think he is okay for Saturday” – probably worth holding onto him even if he doesn’t play. If auba and lindelof are out (is it definite?) might have to think about last minute changes ??? Yeah it’s a tough one – I’m keen to keep both of them so may just ride it out. Just put Aubamayang in last week, didn’t expect much against City, if he doesn’t play against Huddersfield, then he surely has to play against Bate on the 14th, as they don’t play again till the return leg on the 21st, frustrating is an understatement. I think the beauty with Auba is we can wait to see the line up info . . . .if your looking to make a switch to someone like Higuain . . .He’s doesn’t play until Sunday regardless. I think I’ll keep Aubameyang regardless as he might play in the Europa League. Do I leave Kane in or do I transfer him still have 2 transfers left my strikers are aguero and salah and Kane. Tricky this week. I’ve got the same team as you DTT and am currently 40 points ahead in my mini league (£600 prize purse). Most behind me have Son now where I have Auba and Pogba where I have Sterling or the extra defender (most behind me are 3-4-3) and Ederson where I have Kepa. Not sure whether to start blocking yet/ put in Pogba/ Ederson etc so they cant catch me as easily (pretty sure most have used 2 transfers already this month) or just leave it. Your advice was great the other week when I was thinking over putting in Stones instead of Doherty, glad i stuck with the dreamteam legend Doherty! The only players I think at this stage to consider adding/ getting in the team would be : Ederson, Stones, Azpilicueta, VVD, Pogba, Higuaín and Son (and Kane when he’s back ). I’ll personally be leaving it but if you’re worried about people catching you it would make sense to block. Personally I’m playing my own game at the moment but might start to look at people below me in a month or two. If Kepa plays in the Europa League I think it makes sense to have him over Ederson – so could look at extending that lead. Interesting to see Rashford on the bench. Was thinking of swap to him but might stick with Jesus for the time being with Newport in the next weekend. Disappointed I didn’t check the team news before the Fulham game. Rashford benched would’ve opened up the idea of transferring him out for Auba / Higuain / Son. Hope Auba doesn’t make the squad today – he’s the main threat from the team just before me in my ML. Good return from Pogba again but looks like my main rivals beneath me have transferred him in. No Auba, that will do me. Those beneath me don’t have Laca thankfully! DTT are you hanging onto Auba? I’m going to hold onto him. There’s no one else I’d rather have in the long term at the moment other than Kane so trying to be patient. Good example of poor luck with Lindelof missing a clean sheet and now Aubameyang missing the chance to grab a few against Huddersfield after a decent game week last week. Rolled the dice today, using last transfer Azpilcueta out for Pogba, with Rashford on bench, & as expected Aubamayang out through illness, had to go for it 18pts, hoping Aubamayang now makes Europa league on Thursday. Good move. I decided against my sane to Pogba move which is slightly annoying but hey ho. DTT I plan to hold auba to, hopefully he will play Thursday. Disappointed to see Rashford benched (along with Lindelof for those of you who own him) although I get the reasons why OGS has done it. Shows just how much he’s going to go for it in the CL. If they turn over PSG, surely they’ve got to give him the job? What was i thinking putting Kolasinac in my team… I was convinced with their upcoming fixtures. 90+4 Kolasinac 7 rating, assist, own goal, yellow card and 1 point. Hopefully he can earn a few points in the Europa League should he play. That’s just terrible luck mate as it looked a great addition to your team until the dying embers of the game. I’d imagine both will be back for the mid-week game. My concern Chris is, I don’t want Rashford being alternated with Lukaku depending on opposition, I don’t mind if he starts every game scores & is subbed late on, you need your front 6/7 players on the team sheet to start every game, monitor him & Sane throughout February. It will be interesting if Kane comes back with a bang, the ideal template upfront could be Kane, Salah and Aguero once again so the question will be how to generate a lot of funds to turn Rashford into Kane? Yeah, it’ll be difficult for some of us (myself included) to find a way of crow barring him into the team. At least we have time to get an idea of their chances of staying in the CL. If he’s just going to be playing PL that could be quite a lot fewer games than some other striking options. Do you have a plan to bring him back if he hits the ground running again RR? I think the price difference between Rashford and Kane is 5.2m which is a huge amount to raise. Kane could be the best differential in mini leagues as it seems no one has really planned to get him back in. They used up all the funds to strength their team, leaving no money in the bank. I have around 3m in the bank so still a bit short to do the straight swap of Jesus to Kane. It will take two transfers but probably worthwhile to bring in Kane if uses it three transfers. Kane problem not really solved by swapping for Aguero (my records indicate that he scores more goals in the second half of the season than the first) and highest owned player in the game Salah. Could go without Kane for the rest of the season? Yes but dangerous. Kane for me is the most explosive player in the game. He can pick up points in a short amount of games. I remember a few seasons ago, Kane got injured in March and the leader in my mini league decided not to bring him back in and had a lead of 60 points into the final week. Now 60 points is a very nice lead and I thought the mini league was wrapped up as this team was top since day one. The person chasing brought in Kane. Kane in the last two games of the season, both away from home at Leicester and Hull I think scored back to back hat tricks and gained 63 points and so that won the chasing team the mini league. So if chasing I would bring in Kane. * Correction: Probably not worthwhile to bring in Kane if three transfers are needed. Yeah I have £3m itb so it would take two transfers for my team to bring him in. Would probably sacrifice one of Robbo, VVD or Laporte to bring him in, along with Rashford. Early days yet though so not sure of my plan just yet. Sign of a good manager – planning ahead. I think if Rashford would have been 100% he’d have played some part today. Ole just wanted to wrap him in cotton wool after his knock. If becomes more of a regular occurrence I may switch. Lukaku was very poor today by all accounts so that won’t do Rashford’s future prospects any harm. Moving forwards, I want to see how the FA Cup and European games unfold in terms of selection and results before I make my final transfer of the month I think. If United lose against Chelsea and PSG in the first leg then that could force my hand on Rashford. 663 overall position in the Sun Dream Team and 175th in the Telegraph game so doing a decent job in fantasy football so far. I think the telegraph game is my favourite game to play. I like the flexibility of doing transfers at any time – probably makes the game more skill based. Dab into FPL game but have no real love for it – seems over complicated and don’t like the fact that ownership dictates price changes. Maybe will give the sky game I go next season. I’m going to have a look at some of the other FF games next season too as I well and truly have the bug. FPL and maybe one other alongside DT. I do like that DT counts every single game played though in all competitions. I’ll also want to join cash leagues for them too as I reckon this helps to focus the mind if there’s something at stake (it does for me anyway). Did anyone used to play Championship Manager back in the day (or Football Manager as it later morphed into)? I find I get the same sort of satisfaction from FF as I did back in those teenage years playing those games. I could talk all day about CM and FM. 20 years of experience there. It’s the only way my favourite team Newcastle can win the league. I miss those days of playing CM2 – the English and Italian ones. I was too addicted to that game series. The wife said I had to quit the game once my son was born. I then took up fantasy football as a replacement but still play fm on my mobile if I feel depressed about a poor game week in fantasy football. To describe the early Championship Manager game to someone, they’d think you were a lunatic to get joy from playing it. It was just somehow one of the most addictive games you could ever play and just got you hooked from the off. I’ve often wondered what the age demographic of the folks on here was so it’s nice to know there are some of you from my generation who play the game (DT). Initially I thought I might be one of the older ones amongst a load of kids! But I’m realising there are people of all ages who enjoy Fantasy Football. Was this the version of the game where the text used to flash up as the commentary? A much better time when computer games were far more simple. Be interesting to see what the average age is on here. Think I’m only a few years behind you Chris. That’s right, the gut wrenching feeling you used to have when it flashed up that the opposition striker burst into the box and “only has the keeper to beat”. Great game, I remember always trying to sign a young Torres as one of the upcoming stars. I’ll by 33 this year. I’d imagine most of us are 25 plus on here. No idea how to set up a poll though. I’m 38. A few years away from fantasy football peak. I should the whole thing by 40 and then I can retire from the game. Ha ha. Although I do find that real life retired people do very well in fantasy football. I do feel like playing those old CM games but find modern technology doesn’t suit them. Do you know if the games are still going? The last time I played it they had just started having 2D versions of the pitch where you could see the ball being moved around. Those were the days. I remember me and my brother would play the Italian game and I would be Lazio (Sven’s team was Nesta, Nedved, Verón, Crespo) and my brother would be Roma (Cafu, Totti and Batistuta). I would win champions league and he would win Serie A. Every time my team met his the score would be 5-4 trillers. Bringing Pogba in would use a transfer and put me further away from this long term idea. Fair comments. Like the look of the long term plan. Mane is finally showing some form! Did you bring him in yourself Dean? I’ll probably be taking him back out on GW 28 for one of the City midfielders, either KDB if he can start to hit form or maybe back to Sane again. That way I could potentially pick up an extra fixture with that second leg v Schalke. I’ve had Pogba in my team for a while. I have two teams, one of my own, but also a copy of DTTs that I enter into my mini leagues. At the moment DTT is out scoring me. I also got a bit lucky as I missed one of his transfers and ended up gaining about 25pts on him. Yeah, I think I’ll be going with KDB after Pogba’s 7 games I spoke about previously. Either him or back to Sane depending on who’s playing more regularly and form. I have a feeling it’ll be KDB by that time. Yeah, with no Sane appearance you’d expect minutes of some kind for him and Jesus. Sorry to say it again but I am so pissed off I didn’t swap sane for Pogba. Have to hold him next week now with Newport game but could well be another blank for him. Think I will ship for KDB in a few weeks now as missed the fixtures I wanted from Pogba. How did everyone get on points wise? 89 here. Those are the ones that hurt the most where you think of a strategy and don’t go for it. I’ve done a few myself this season so you’re not alone my friend. Sane must have minutes of some kind for that cup game now surely? Only 68 points for me – poor week so far but I’ve not dropped much on the leaderboard. Really frustrating that Lindelof and Aubameyang both missed their games and that Sane was benched. Yeah, having three miss out is tough. I think to still get 68 though with this in mind is still a decent return. I can see Sane playing against Newport now and getting a couple of goals at least I’m reckoning. I thought he’d get at least half and hour today and maybe be rested for that European game but he surely starts the FA cup game now. Aubameyang should be ok for the Europa game you’d think too along with Lindelof in the CL. Doherty to still come as well so could still be a decent week DTT. Hopefully it evens out with Aubameyang getting game time in the Europa League and Sane playing against Newport but we will see. I’d rather have the points on the board. I’d imagine there are quite a few big scores out there this weekend. Hope you are all among them! 109 points for mine, overall position 496. 👏 You’re on one hell of a roll mate. Top 100 next target? Targets are mini leagues really. Would be amazing to get into top 100 but feels like some way off there…. Good effort lads who are currently in the top 500. Some going is that. 85 points this week, I’ll take that after finishing yesterday with only 23. Not far away from breaking into that top 1,000 currently sitting at 1,044. Happy enough at this stage. Is anyone concerned about their Chelsea assets after today’s horror show? I’d be surprised if Sarri is there at the end of the season as he’s too stubborn for his own good. Having only one way of playing is going to make it easier for opposition to set up against you. His insistence of playing Jorginho as the holding midfielder whilst the best defensive midfielder in the world goes bombing forwards is beyond ludicrous. I also think this will be Hazard’s final season in a Chelsea shirt. A team going nowhere fast or can they pull it around? They don’t look good do they, think it’s been happening for a bit, just blurred by the Huddersfield result. It’s starting to become a concern, -5 points for Kepa is a disaster. However I wanted him for these Europa League fixtures. If he doesn’t play Ederson was the one I wanted anyway, I’ve just been holding back until these extra fixtures were out the way. However it’s cost me 13 points today so can’t see that being made back across the extra fixtures anyway. Same boat as you, Kepa to Ederson was a transfer I highlighted but I held back because of the Euro fixture. Thought Chelsea would get at least one today, and didn’t expect six against. Hopefully the Europa League fixtures come good in terms of points. Might even extend that lead further. Really need something big from Aubameyang myself. Yeah if Kepa doesn’t play in the Europa League I’ll almost certainly get Ederson before their prices go up and down. I’ll almost certainly be making the transfer even if he does start against Malmo. Alongside the Malmo return fixture, Kepa will be up against Utd, City again and then Spurs. Yeah very true and after their recent performances who knows what will happen in those fixtures. Missed the boat on Pogba big time!! Was tempted to put him in a couple of weeks ago in favour of Sane. Since then, Sane has been benched twice and Pogba has earned 28 points!! I was apprehensive about using my last sub with 3 weeks to go! My hand may be forced to make this move in spite of Utd’s fixtures stiffening up because the 6 people chasing me, ALL have him!! Tough one. With everyone having him I’d be tempted to block them as you suggest. However if Sane starts against Newport must be worth keeping him for that game? – I watched the Everton game and thought I saw the first few signs of a dip in form from Sane. He was largely ineffective. Of course I’d fully expect him to come good again at some stage. – My main ML (chasing) rival has him. – Rotation. Sane is much more of a risk of rotation currently than Pogba imo. – Pogba’s recent good form and the fact he’s on pens. I don’t know what to do about it at the moment. It will be harder for him to pick up points given their fixtures, but as you say Pogba is on pens and Utd seem to be getting quite a few of those lately. I actually thinking of taking Pogba out. In 2003 Sports Interactive (the two brothers who founded the original game in 1992) and Eidos (the publishers) split. Sports Interactive retained the game’s database and match engine, producing a new game based on these titled Football Manager. Eidos retained the name and interface, with BGS taking over the development of Championship Manager. Although the two series initially ran alongside one another, the sales of Championship Manager began to fall below those of Football Manager. I remember playing both of the games and Football Manager was the game which you’d recognise as the updated version of those original CM titles. The new Championship Manager’s were a poor relation. The Football Manager series are still hugely popular to this day and you can play it on many platforms, including a smartphone version. I’ve often been tempted to give it another crack but work, family life (and now playing Fantasy Football) make finding the time too difficult. I think it was the transition between Championship Manager and Football Manager that I remember. Definitely played the game where the text flashed up and then the next game was where you had the 2D pitch. If I remember rightly this was probably the first Football Manager game. If I had the time I’d probably have a look at it again now but it’s probably way too technical for me now and very time consuming I’d imagine. Immensely time consuming. I could lose days playing the old versions so imagine what it’s like now?! (Sorry, thatmeant to say BEFORE the text gets too squished). Reality check for Man utd. Shame about Neymar and Cavani being injured. Don’t watch the french league so last time saw them was at the World Cup. Comfortable win for PSG. That Mbappe is a very good player. Working the night shift tonight so only just realised Pogba got red carded. So much for my “extra fixture”. 😂 Thanks for that Pogba! I presume this just means he misses that 2nd leg? May have to consider removing him earlier than initially anticipated now the extra fixture is null and void. Maybe a case of Pogba In, Pogba Out. He’s always capable of something like that. Annoyed I missed the points from the weekend but glad I didn’t put him in. Basically he didn’t fancy 2nd leg, got himself sent off, Pogba, Rashford, – 3pts, need Aubamayang not only to play on Thursday but needs to do serious damage. Need Auba to return as well. Does anyone know if he’s even going to feature? Is he over his illness? Well that Pogba sending off has made me feel a whole lot better and it changes the dynamic somewhat of my urgency to get him in. Yes, I’m still disappointed to have missed out on the 25 point haul in the last two weeks and yes he will still pick up points in the coming weeks, but most of his big hauls have been generated by easier opposition and apart from one or two fixtures, they now face tough opposition until the end of March. Disappointing night last night with the Pogba red and a blank for Rashford, especially as he was rested at the weekend. Am I right in thinking Pogba just missed the return fixture? Still think my only transfer before Friday will be Ederson in for Kepa. Man U have some tough fixtures so may look at moving Rashford on, with Son and Auba being the two on my radar. Yes Dave, he just misses the return leg. Yeah, I’m considering Rashford to Aubameyang too. His short term fixtures are very hard to ignore. However currently I’m £0.1m off affording him. Need Rashford to rise and Aubameyang to at least remain the same. Do you guys think this is a possibility? Chris, i think that Rashford will definitely rise and Auba should stay at the same price as he didn’t feature last week. Maybe it will depend on whether he plays and scores points tomorrow. Thanks C&B, that was my inkling too. It’s difficult to ignore Son though, who just keeps on shining in Kane’s absence. I keep reading about how exhausted he is but the man’s like a Duracell Bunny! I guess he’s my back-up option if Aubameyang does rise. Can Son sustain this remarkable form? He’s probably the main reason why Spurs’s season is still very much alive and kicking after the injuries to Kane and Alli. Very similar dilemma I’m having. Son has scored 11 in his last 11 which is very hard not to ignore! Auba on the other hand has easier fixtures but blows very hot and cold. Can often go a few games without scoring but then goes on a spree. I’ll be making my Ederson – Kepa change today to take advantage of price movements, but will save my Rashford decision till after the price changes as I reckon he’ll go up. Who are you leaning towards Dave? I just can’t look back those next three Arsenal fixtures, all at home too. Split down the middle at the moment. The chap beneath me in second place has Son, the lad in third has Auba. Arsenal have better immediate fixtures, Spurs have better medium term fixtures. Could be Auba up to GW28 and then think about reshuffling the pack – Kane will also likely be back by then but will he hit the ground running? Hard to justify his price straight after injury. None of my main rivals have Son. The closest rival with him is 100 points behind me so I’m not overly bothered, but the primary reason I have not put him in is because part of me has always questioned whether he could maintain it. Dream Team is all about purple patches and I can see me bringing him in, only for him to dry up like his start to the season where scored just 5 points from his first 9 games! If I had a decent lead (just 13 points), I’d be tempted with Son as a differential, especially as he’s outscoring Auba of late, but Auba has high ownership below me, so it would be a dangerous move. I got Son in my team, put him straight away in Feb as had three games at home in a row. A good differential at 5.3% when I brought him. I like going down the differential route. Can be boring for me to have the same players as everyone else. Now thinking of a short term move to lacazette or Aubameyang. Personally don’t think there is much difference between these two. Form might suggest I might go with lacazette as unsure about Aubameyang’s fitness following illness. Yeah, I’ve just looked at Son again and I’m very surprised to see he still has relatively low ownership. I still prefer a short-term move for Aubameyang for my last transfer this month then possibly consider Kane next month at some point. Son could be my back-up plan though. Hi guys slightly off topic but what date do the March transfers come into effect? After last nights impressive Spurs performance, and player that has popped up on my radar now is Vertonghan. Playing as a left wing-back really suited him and he was a constant menace by all accounts with good deliveries as well as getting his goal. With Ben Davies being out, I can see Rose and Vertonghan sharing that role in the coming weeks (with Vertonghan slotting back into the centre when Rose plays). Worth considering? Auba doesn’t start for Arsenal. Did breathe a little sigh of relief but does add doubt to my Son vs Auba debate 😂. Selfishly hoping for a poor Arsenal result meaning they need something from the home fixture, should work in my favour if I do draft Auba in. Aubameyang will definitely start that one now, especially after that Lacazette red card. That’s enough to confirm it for me. Rashford to Aubameyang after the price changes (I’m now hopeful that Aubameyang will fall or at least remain the same and Rashford will rise, which I need to happen to afford it). Looking ahead into next month, I’m really tempted to get Kane back in if he’s up and running ok again in March. It means I’ll have to downgrade a player and the one I’m considering bringing in is Lewis Dunk for Doherty. I’d be hoping Doherty continues to rise in price week on week until GW28. This would then give him a value of £4m. Assuming Dunk neither goes up nor down (£2m) during this time (for arguments sake) that would give me an extra £2m. I should then have a chance of bringing Kane back in, depending on price fluctuations. It’s all ifs and buts I guess but there it is. I’d like to think Brighton could tighten the ship at the back for those games and get a couple of clean sheets. No more FA cup cup replays I think from the fifth round onwards. Also if Palace win in FA Cup this weekend, then I think spurs – palace game will be postponed so Kane might not a fixture in game week 29. With getting Kane in though I’d probably be in it for the duration (bar injury of course) so I’d be getting that missed game back at some stage, providing he’d play of course. Wouldn’t mind Wolves progressing either tbh but with a really tough game in the quarters, and Brighton progressing but with an easy game. That way I’d be potentially losing Doherty for Dunk. Then Aubameyang for Kane. That way Aubameyang would be missing that GW and Kane wouldn’t. Extra fixture for Dunk with a re-scheduled game against Cardiff. That being said to never know with Doherty! Less than a fortnight ago, selecting Aguerro was a precarious decision to make, 2 fixtures later 51pts, I selected Aubamayang 3 fixtures later 0 pts, Emery last week Aubamayang close to playing at weekend, reason illness/cold, 4 days elapses, still sitting on bench for Europa league against Bate, a European giant, Norman hunter, Billy bremner Johnny Giles, Tommy Smith, Jimmy case, Graeme sourness, would any of those players miss 2 games for an illness, nothing short of pathetic, puts you off football frankly, put your best players on from the start, win the game make subs, out of FA cup aswell, no game till following Thursday, had my rant. To quote Monty python Chris, always look on the bright side of life, you have to add a humorous spin on this game, or it will drive you crazy, no good for my blood pressure though. I’m also guessing David you’re one of the (ahem) older generation like myself of the forum? With the player names you quoted? Last time I counted, I think I’m in the region of 52yrs on planet earth, I obviously love dreamteam, but I like to win I’m really struggling this season, 2nd place still attainable, must try & not be so rash when making transfers. Those were different days mate. There was every likelihood that the manager would not use more than 13 players all season from his squad! !